"Professional Mobile Discos And DJs For Hire"
Professional mobile disco based in Dartford, Kent with an extensive over 100,000 music tracks from the 1960s through the decades, to the current top 40 charts. Karaoke hire & video disco, also available. Reliable service, reasonable rates. Last minute bookings accepted / emergency cover service available. Professional grade light shows. Controlled lighting available. Wide coverage area. Over 20 years experience. 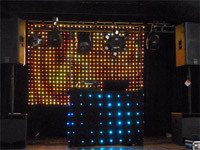 Modern equipment and professional set up of disco equipment. Dance floor, photo booth and love letters, hire also available. Make your own music playlist, on our website. Required by many venues, Power Sounds Discos And Karaoke has a current PLI policy with National Association of Disc Jockeys in the amount of £10 million. Also required by many venues, Power Sounds Discos And Karaoke has supplied satisfactory evidence of holding current PAT inspections of their equipment dated within the last 12 months. A Method Statement, outlining Power Sounds Discos And Karaoke&apos;s Health & Safety procedure for setting up disco equipment has not been supplied. Why do people choose to book Power Sounds Discos And Karaoke? "Adam and his team did a fantastic job, we only contact him on Friday night and he was able to provide a great disco for the next night - even being over an hour away. we asked for low key music early evening and then turning up the volume about 7pm everybody was very impressed with the "light work" Adam was even able to accommodate one of our guests passion for "Annie" with a karaoke session for the young lady to sing along to. Will definitely use again and recommend to everybody." "Many Thanks For Your, Feedback. It Was A Pleasure To Meet You all and We Hope To Be Of Service, To You In The Future. With Best Wishes Adam." "Because of our choice of venue, the DJ was unable to use his regular set up so had to use a fairly simple audio set up and lighting rig - however, he did a great job and the evening was a great success. A good value, no frills, no fuss DJ; exactly what I wanted. We are already planning the next one and will use you guys again no question!" "Many Thanks For Booking With Power Sounds. Hopefully Look Forward To Working With You Again." Power Sounds Discos And Karaoke also offers a range of additional party services not directly linked to musical entertainment. Get FREE no-obligation disco quotes from Power Sounds Discos And Karaoke and other DJs covering your venue. Take 2 minutes to fill in some basic details and we'll do the rest! If you are contacting Power Sounds Discos And Karaoke about an event, it's always a good idea to include the DATE, LOCATION, EVENT TYPE, AGE GROUP and TIMINGS to speed things up!